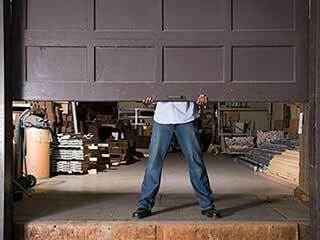 The cost of garage doors today is a reason enough to take good care of them. Today garages are used for so many reasons apart from simply parking our cars. We use them to store goods, work in them, and many times our children play in them. Due to their big, heavy features they can pose a safety and security challenge when not operating properly and it is imperative they are in tip-top working condition. Don't wait for the worst to happen; garage door safety should be a top priority if you intend to avoid a serious injury or even a fatality. Take appropriate action to ensure your garage door is always working at its best. There are a few things that every homeowner should know regarding garage door safety. Garage doors come in many sizes, configurations, and materials. There has always been some concern with the overhead door as a consequence of the risks surrounding the springs which are used for balancing the door weight. The dangerous aspect is when these spring systems are not inspected, maintained, and weaken with rust as time passes. It is critical that the installation of a new garage and torsion springs is performed by a professional. Severe injuries have occurred when unqualified people have installed or serviced torsion springs. Children shouldn't be allowed to play with the garage door, remote controls or push button wall controls, which should ideally be mounted well out of reach of small children. If someone has backed into the garage door, have it inspected as the operating system may have become misaligned. When opening or closing your door, ensure that no children or pet enter or exit the garage while the door is closing. An unchecked door is a hazard. To be truly effective, a garage door needs to be checked and maintained in order for it to be durable and trustworthy.